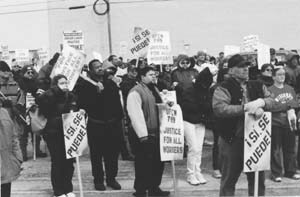 Meat packers striking Tyson in Jefferson, Wisconsin, at March 29 solidarity rally there. Supporters include UFCW Local 789 members from St. Paul, Minnesota. ST. PAUL, Minnesota--Striking meat packers at Tyson Foods in Jefferson, Wisconsin, are taking steps to strengthen their strike and reach out for support. At the same time, the company is trying to ratchet up the pressure by expanding the use of strikebreakers. "The company has had difficulty recruiting scabs," so far, said Mike French in an interview. French is an executive committee member of United Food and Commercial Workers (UFCW) Local 538, which organizes the striking workers. "There are two buses of scabs that cross our picket lines in the morning. I have seen that one is only half full, the other is less than full. The company made a big effort to recruit scabs from among workers laid off from Tyson’s Culinary plant in Chicago. We have not seen a single new scab that the company has been able to recruit that way." Some 470 meat packers worked in the plant before workers walked out February 28. On April 4, the union received notification from the company that it intended to recruit more scabs beginning April 7. Management said it will consider the scabs currently working in the plant as of that date full-time Tyson employees. "The union is calling another solidarity rally for Saturday, April 26, in Jefferson in front of the plant," French told the Militant. "Everybody is welcome who supports the strike. We are urging unions, organizations, and individuals supporting us to come and bring donations of food." Two previous rallies in March mobilized hundreds. They included union contingents from a number of nearby plants and from other parts of the Midwest. "We are also planning other actions around this area in the coming weeks," said French. "Two members of the Truth Squads will be coming to the Twin Cities the weekend of April 12. They have been invited by Local 789 of the UFCW to speak at a local labor conference called Meeting the Challenge." The Truth Squads are teams of Tyson strikers who have visited a number of large meatpacking plants in the Midwest over the past several weeks. They have distributed information, spoken to the leaderships of the local unions, and collected donations of money for their fight. "In a local initiative to advance solidarity with our fight, Local 179 in Cherokee, Iowa, is organizing a benefit dance for May 24," French said. The strike began after meat packers rejected 10 concession demands by the company that would cut a total of more than 30 percent in wages and benefits. Tyson Foods, the world’s largest processor and marketer of chicken, beef, and pork, reported gross income of more than $23 billion last year. Two meat packers at Dakota Premium Foods in the Twin Cities, who are members of UFCW Local 789, were among those who took part in the March 29 support rally for Tyson strikers in Jefferson. They spoke on the importance of solidarity with the embattled meat packers at an April 4 Militant Labor Forum in St. Paul, Minnesota. "I was impressed with the spirit of solidarity I could see in all the strikers," stated Miguel Olvera, a leader of the two-year-long successful union organizing drive at Dakota Premium Foods in South St. Paul and a speaker at the March 29 rally in Jefferson. "From my experience in the Dakota fight I know that workers in this situation should not step back but fight, and fight some more. With more solidarity the strikers can move forward. There are not a lot of struggles like this taking place in the United States right now. But each of these fights is important. It is the details of organizing unity that are so important. And this depends on leadership, which is something that all workers have the potential within themselves to develop." "These strikers are open, eager, and happy to see solidarity from workers from St. Paul, Omaha, Des Moines, and Chicago," stated Jenny Benton, another meat packer at Dakota, and a shop steward of UFCW Local 789. "The company has been trying to divide working people over this strike by recruiting scabs who are Latino. The big majority of the strikers are U.S.-born. However, these age-old tactics of the companies to divide workers are not as effective as they once were. The delegation sponsored by my local was 13 people, half Latino, and was very well received. When Miguel spoke, the Tyson strikers gave him a big round of applause in appreciation." One worker in the audience suggested that the Tyson strikers should raise their demands to the political level. "The most important thing is to advance support for the strike as it is, against the steep concessions demanded by Tyson," stated Benton.